Watch out Ohio, the Rochester Robot is coming! From the January Kick Off to the day of Bag and Tag, the Benjamin Franklin FIRST (For Inspiration and Recognition of Science and Technology) Robotics team XQ 1450 had only six weeks to bring their robot “Huck the Climber” to life. Spending 4 – 7 hours a day including Saturdays, the students and their mentors created a Frisbee throwing, pyramid climbing dynamo. At the 2013 FIRST Finger Lakes Robotics Regional held at RIT in early March, Huck powered its way to an 8th place finish out of 49 teams from Canada and the Northeast. March 27-30 the team, as well as other teams in the Rochester region, will travel to the Buckeye Regional in Cleveland, Ohio. Here’s a short video the team produced displaying the intense competition. XQ Robotics Team 1450 at Franklin HS’s Norton Street campus began in 2005 thanks to a grant from Xerox. 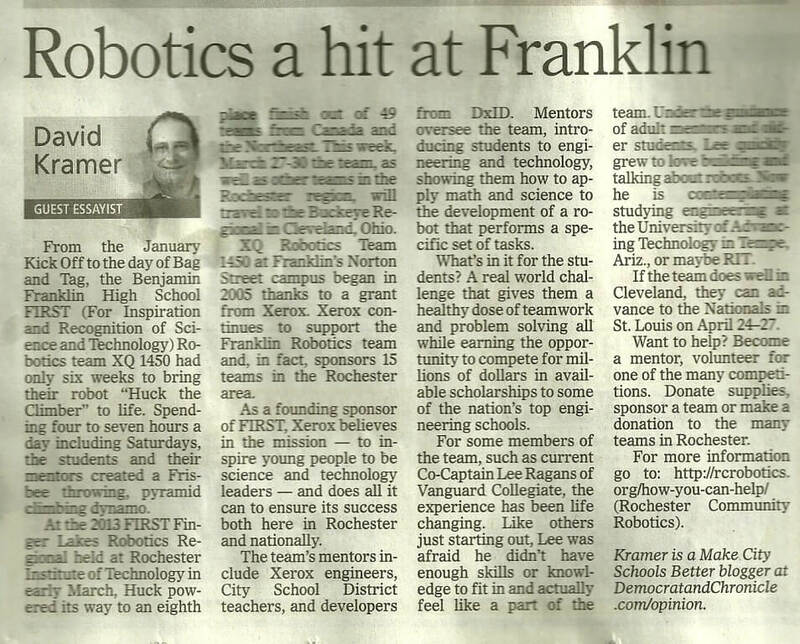 Xerox continues to support the Franklin Robotics team and in fact, sponsors 15 teams in the Rochester area. As a founding sponsor of FIRST, Xerox believes in the mission — to inspire young people to be science and technology leaders—and does all it can to ensure its success both here in Rochester and nationally. The team’s mentors include Xerox Engineers, RCSD teachers, and developers from DxID ( http://www.dx-id.com/index.html ). Mentors oversee the team, introducing students to engineering and technology, showing them how to apply math and science to the development of a robot that performs a specific set of tasks. They get introduced to everyday life challenges, importance of teamwork, and what’s known in the FIRST world as GRACIOUS PROFESSIONALISM, helping other teams, even your opponents! And, it’s FUN! What’s in it for the students? A real world challenge that gives them a healthy dose of teamwork and problem solving all while earning the opportunity to compete for millions of dollars in available scholarships to some of the the nation’s top engineering schools. The Franklin team members have earned some of these scholarships, including to RIT. For some members of the team, such as current Co-Captain Lee Ragans of Vanguard Collegiate, the experience has been life changing. Like others just starting out, Lee was afraid he didn’t have enough skills or knowledge to fit in and actually feel like a part of the team. Under the guidance of adult mentors and older students, Lee quickly grew to love building and talking about robots. While Lee always had an interest in film and images, robotics has inspired him to dream bigger. Now he is contemplating studying engineering at the University of Advancing Technology in Tempe, Arizona or maybe RIT where he can watch future FIRST competitions with the eye of a budding master. If the team does well in Cleveland, they can advance to the Nationals in St. Louis on April 24–27. Sound like fun? Want to help? Become a mentor, volunteer for one of the many competitions. Donate supplies, sponsor a team or make a donation to the many teams in Rochester. For more information: rcrobotics.org/how-you-can-help/ (Rochester Community Robotics).